Moosonee c. 1962. Town and Moose River in foreground, radar base and domes in the background. 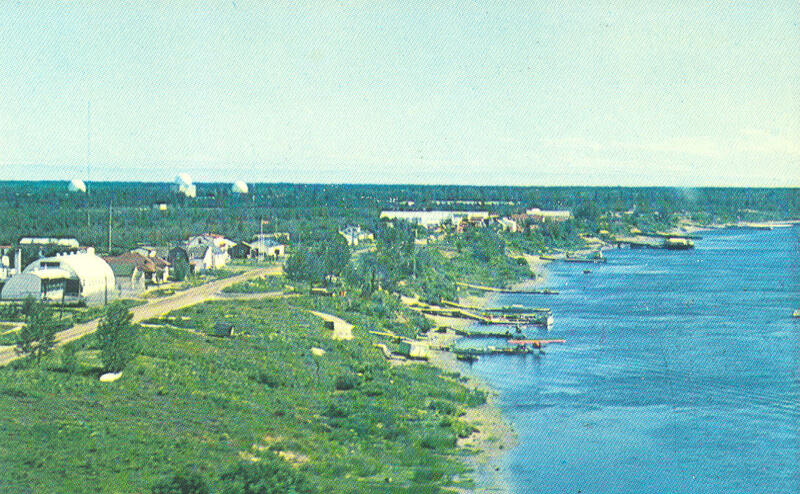 Source: Moosonee Postcards, Paul Lantz website. Considerable research has been conducted on the Canadian North over the past few decades. This research has focused on resource development (mining and forestry), on small resource towns, and on mega-projects such as the James Bay Hydro Project. To date, little work has been produced on the relationship between military activity in the north and the landscapes, communities and people affected by such activity. Only in the past decade have historians and geographers, like P. Whitney Lackenbauer and Matthew Farish, opened the door to a broader discussion about how military operations and settlements/bases have affected northern people and northern physical environments. During the early years of the Cold War, three massive radar lines were constructed across the north: the Distant Early Warning (DEW) line, the Mid-Canada line, and the Pinetree line. The goal of the radar lines was to monitor Soviet plane traffic across the Arctic in order to intercept planes, armed with atomic weapons, which were intended (presumably) to destroy North American cities. Most of the research on radar lines has focused on the DEW line and the high Arctic. Little research has been conducted on the Mid-Canada and Pinetree radar lines. My research examines the impact of the Cold War on the near north, with the community of Moosonee, Ontario as a case study. Moosonee is a small northern Cree community located on the Moose River, ten kilometers south of James Bay. It was a Mid-Canada Line shipping center in the mid-1950’s and it became the site for a Pinetree radar base in 1961. “The Community experience”: This involves an assessment of how the construction of a radar base (adjacent to an existing town) changed the land uses, physical infrastructure, and landscape of the Moosonee area. Kerry Abel links the concepts of personal and community experiences in her recent writing on Northeastern Ontario. She states that “The experience and symbolism of community continue(s) to play a major role in the human experience.” My thesis research will attempt to make the same type of linkages by studying Moosonee. The town site of Moosonee experienced little development until the Temiskaming and Northern Ontario Railway (T. & N. O.) connected the town to Cochrane in 1932. By the mid 1950’s Moosonee had become a shipping centre for more northerly Mid-Canada radar base sites, like Fort Albany and Winisk. Several Mid-Canada Line (MCL) articles referred to Moosonee as a Cold War construction and shipping center. For example, in the 1958 Roundel, Flying Officer S. G. French described the establishment of “marshalling areas at ends-of-steel “. In Ontario, this meant Moosonee as the furthest north railway line or “end-of-steel”. French then described how Moosonee, became “a new main base of operations.” He emphasized the role of Moosonee as a central operations base by noting that when work was completed much further north, helicopters returned to Moosonee. French also described winter tractor train operations. He wrote that “During the winter of 1955-56 about 11,000 tons of materials were moved …by tractor train. At their peak, these trains running out of Gillam, Manitoba and Moosonee, Ontario used over 400 sleds and over 40 heavy tractors.” Clearly Moosonee was part of Cold War activities long before it hosted a radar base. Air Photo of Moosonee Pinetree Radar Base, 1962, Department of History and Heritage Archives, Ottawa. By 1961, Moosonee had its own military base–a Royal Canadian Air Force (RCAF) Pinetree radar base known as ‘Sasakipao’. 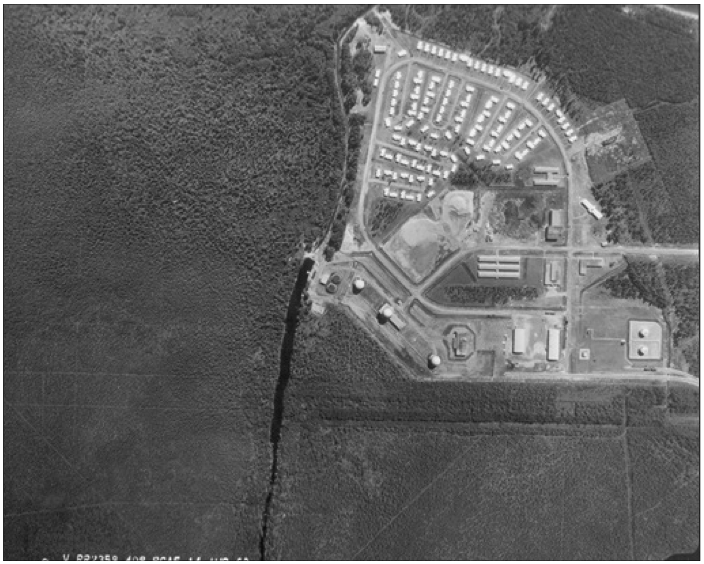 This base, constructed only a mile or so from downtown Moosonee, operated from 1961 to 1975 (see “Air Photo of Moosonee Pinetree Radar Base, 1962”). It became the home for 150 RCAF officers and airmen, their spouses and their dependent children. It also became the workplace for approximately 60 civilian employees from Moosonee. Thesis research conducted to date suggests that the Cold War affected the people and the community of Moosonee in both positive and negative ways. Cold War military planners had a singular and immediate goal: to build and occupy defensive military sites in the north. My initial archival work suggests that the social and physical (landscape) impacts of such development were irrelevant to the military planners, and that local people almost seem to have been ‘invisible’. However, interviews of current and former residents of Moosonee give quite a different picture of human interaction. Interviewees state that there was a lot of interaction between radar base and town residents. Almost everyone who has been interviewed so far has indicated that they not only worked at the radar base, but that they joined the mess clubs and took part in all of the base recreational activities—from curling and bowling to dances and carnivals. The common refrain is that people developed specific life-long careers, and recreational interests, because of their time at the radar base. My initial research suggests that Cold War community development in Moosonee followed some of the “boom and bust” stages observed by land use planners in northern resource towns. That is; the initial ‘boom’ created construction jobs and the ‘bust’ phase — closure of the radar base — meant a loss of jobs and an immediate need to deal with abandoned infrastructure. However, the way that Moosonee residents handled the ‘bust’ phase was impressive. Two examples, which deal with housing and education, demonstrate this. As soon as the base closed, the town pulled every second home from the crowded radar base subdivision and sold these homes to both local people and to residents of Moose Factory Island (across the river from Moosonee). At the same time, the town immediately converted radar base facilities, from the Officer’s Mess to the Recreation and Maintenance Buildings, into a brand new high school. The creation of a high school meant the end of an era. It meant that local students no longer had to travel south by train to Sudbury, North Bay, or Timmins for five long ‘away from home’ years. Finally, the new high school was also available to students in Moose Factory Island who lived, during the school week, in the renovated radar base barracks. The creation of housing and the new school demonstrate how a local community exercised agency in dealing with Cold War change. Thesis research will continue to examine the changes that Moosonee experienced—both the personal and the community/infrastructure changes– and the related impacts. Sue Heffernan, is a PhD Candidate in the Human Studies Program at Laurentian University. P. Whitney Lackenbauer and Matthew Farish. “The Cold War on Canadian Soil: Militarizing a Northern Environment.” Environmental History12 (October, 2007): 920-50. William Freudenburg. “Women and Men in an Energy Boomtown: Adjustment, Alienation, and Adaptation.” In Rural Sociology 46, no.2 (1981): 220. Freudenburg’s work on the impacts or consequences of development on communities informs research on Moosonee. More current work that has guided my research is Joy Parr’s Sensing Changes: Technologies, Environments, and the Everyday, 1953-2003. Vancouver, UBC Press, 2010. Kerry Abel, Changing Places: History, Community, and Identity in Northeastern Ontario (Montreal: McGill-Queen’s U. Press, 2006), xiv. S. G. French, “The Mid-Canada Line: Operation Whirlybird.” The Roundel (June/July, 1958): 12-13. Emphasis mine. Interesting research project. I’ve been studying W Arctic DEW Line stations and their effects upon the Inuvialuit communities of the Mackenzie Delta and North Slope in the 1950s and 60s. I’m interested in chatting about methodology. Thanks for your comments. I sent an email to you but I also wanted to post a note about your article on the DEW Line in the Public Historian. I enjoyed reading it and added it to my lit. review a couple of years ago. I would be happy to compare notes on methodology. Interesting research. In what ways are you incorporating indigenous knowledge and voice in your research? Thanks for responding. I am currently working on my Masters thesis and decolonizing is a necessary component. And I agree it is life long. I am also working toward doing my fieldwork in Moose Factory. Happy to see that you’re doing the same. How do you see your research benefiting the community of Moosonee? I look forward to reading more about your dissertation. I always have some trouble giving my opinion of benefit to the community of Moosonee because I think the people of Moosonee are a much better judge of the benefit of my research than I am. I can only hope that former and current residents will find it worthwhile reading about early infrastructure and services in the community. I think they will appreciate seeing how their opinions on the town’s future were (sometimes) significant in shaping the community. Finally, I think it is important to document the Cold War situations where the opinion of local people was not taken into account. Interesting, I’m 30 years old born and raised in Moosonee, and all I knew about old yellow buildings is that is was a radar base. I know what you mean. I had been to Moosonee about a dozen times before I started to wonder what people meant by ‘the base.’ For a long time I just assumed it was an army base and then eventually I learned it was a Cold War air force community. My home is Moose Factory, and I graduated from UWO with two degrees and returned to Moosonee with a new wife in 1965 as the Anglican Priest and civilian padre at the Air Force base. When I left 19 years later we had three children and had one of the most challenging but wonderful ministries any priest can have. Iwas the chair of both the High School and the James Bat Education center for many years until we left in 1984. I want you to know how mulch i appreciate the tone of your discussion, it is respectful and not condemning in any way. I really appreciate your comments. I saw your name several times in the Moosonee archives and am thrilled to hear from you. I will email when I get a chance over the next week or two. Oh, you really must call Dad (John Clarke) Sue! His father was also the Bishop in Moose Factory, so Dad’s got A LOT of history of the area he can share. After the base moved, Dad actually tore down the old church on the base and tractor-trained it up the coast and rebuilt it! I’ve got a bunch of photos from that trip scanned into my computer. And, I must mention I’m sitting here right now in Edmonton on an old desk chair from the Moosonee base – it still has the brass DND tag on it! Hello Joseph, You might want to try this radar base website: http://lswilson.dewlineadventures.com as it has photos and information on all of the Canadian radar bases, including photos of individuals. I will still search and see if I can find something more specific for you. This past summer I made it back to Moosonee for a visit. I have distinct memories of the opening of the base, although I was just a kid. We lived there from ’57 to ’64. Very interesting research! (The PDF of the thesis on Moosonee is at the bottom of this link).